A 100 Great Geosites nomination from Dr. Catherine Duigan. Every year I bring students from Bangor University on a fieldtrip to Cwm Idwal in Snowdonia. It is always a thrill to tell them they are walking in the footsteps of Charles Darwin who came here to learn geology before he embarked on The Beagle. Cwm Idwal was Wales’ first National Nature Reserve designated in 1954. It is one of the best places in the country to see the effects of glaciation and to learn to recognise the features of this dramatic ice scoured landscape. A glacial ridge holds the lake, Llyn Idwal, against the base of the cliffs which define the natural amphitheatre. In Cwm Idwal the geology also acts as a stage for spectacular ecology. The cliff faces serve as hanging gardens for several species of Arctic-alpine plants, including The Snowdon Lily (Lloydia serotina). 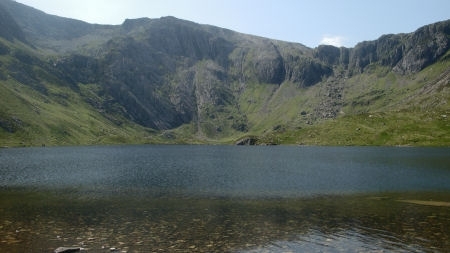 My students come to see why Llyn Idwal has been selected for conservation as an internationally important example of a mountain lake type included in the EC Habitats Directive. Water Lobelia (Lobelia dortmanna), Shoreweed (Littorella uniflora) and Quillwort (Isoetes lacustris) grow in the crystal clear waters. We have been there when clouds form a roof over the cwm and when snow reaches down from the top of Tryfan, in biting cold horizontal rain and glorious sunshine. It is always unforgettable for students. Happy 60th birthday Cwm Idwal National Nature Reserve! Hope you do well as a #100geosites nominee! Tags: Cwm Idwal, Darwin, geology, glaciology, Snowdon. Bookmark the permalink. Nice blog on a great geo-site. Cwm Idwal also has a large rock fall on the backwall slope – possibly a deglaciation unloading feature?